Scientist Carl Sagan said many times that “we are star stuff,” from the nitrogen in our DNA, the calcium in our teeth, and the iron in our blood. It is well known that most of the essential elements of life are truly made in the stars. Called the “CHNOPS elements” – carbon, hydrogen, nitrogen, oxygen, phosphorous, and sulfur – these are the building blocks of all life on Earth. Astronomers have now measured of all of the CHNOPS elements in 150,000 stars across the Milky Way, the first time such a large number of stars have been analyzed for these elements. 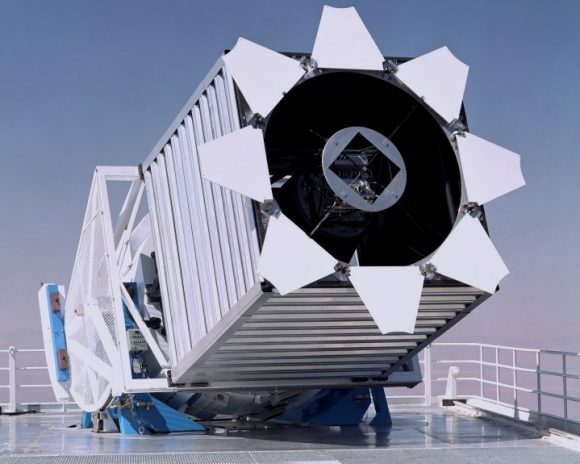 Astronomers with the Sloan Digital Sky Survey made their observations with the APOGEE (Apache Point Observatory Galactic Evolution Experiment) spectrograph on the 2.5m Sloan Foundation Telescope at Apache Point Observatory in New Mexico. This instrument looks in the near-infrared to reveal signatures of different elements in the atmospheres of stars. While the observations were used to create a new catalog that is helping astronomers gain a new understanding of the history and structure of our galaxy, the findings also “demonstrates a clear human connection to the skies,” said the team. While humans are 65% oxygen by mass, oxygen makes up less than 1% of the mass of all of elements in space. Stars are mostly hydrogen, but small amounts of heavier elements such as oxygen can be detected in the spectra of stars. With these new results, APOGEE has found more of these heavier elements in the inner part of the galaxy. Stars in the inner galaxy are also older, so this means more of the elements of life were synthesized earlier in the inner parts of the galaxy than in the outer parts. So what does that mean for those of us out on the outer edges of one of the Milky Way’s spiral arms, about 25,000 light-years from the center of the galaxy? Holtzman added it is likely that, if there is a minimum required abundance, that minimum was probably reached earlier in the inner parts of the Galaxy than where we are. The team also said that while it’s fun to speculate how the composition of the inner Milky Way Galaxy might impact how life might arise, the SDSS scientists are much better at understanding the formation of stars in our Galaxy. Sloan Foundation 2.5m Telescope at Apache Point Observatory. Credit: SDSS. “It’s a great human interest story that we are now able to map the abundance of all of the major elements found in the human body across hundreds of thousands of stars in our Milky Way,” said Jennifer Johnson of The Ohio State University. “This allows us to place constraints on when and where in our galaxy life had the required elements to evolve, a sort ‘temporal Galactic habitable zone’”. The catalog is available at the SDSS website, so take a look for yourself at the chemical abundances in our portion of the galaxy.